Barry Rigal was born in London and now lives in Manhattan. He is a full-time bridge professional player, teacher, author, and ACBL Bulletin editor, who has been chief commentator at major events around the world for the past decade. Winner of multiple national titles in the UK and US, he has written several books on bridge and is author of the best-selling Card Games for Dummies as well as Breaking the Rules: First Hand Play. His target is to visit a new state in the US and a new country every year. 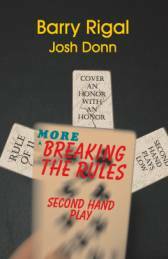 Josh Donn grew up in Syracuse, NY, and has lived in Las Vegas, NV, since 2006. During that time, has been an accounting manager at several major casinos on the Las Vegas strip. He is also a professional bridge player. He won the World Junior Team Championships in 2006 and has two national titles in the US, including the prestigious Blue Ribbon Pairs. He enjoys helping his mother run her successful bridge club, playing with his three young nephews, and playing or reading about bridge any chance that he gets.